Fernando Guerra presents photos of Israeli Pavilion and installations by Aires Mateus, Alvaro Siza, Eduardo Souto de Moura and Marcio Kogan at the 13th Venice Architecture Biennale. Fernando Guerra posted many photos of Favrica Vitra by Alvaro Siza, School in Vila Nova da Barquinha by Aires Mateus, and others. Fernando Guerra presents photos of ETAR de Alcântara, wastewater treatment plant in Lisbon designed by Aires Mateus, Frederico Valsassina and Proap. Photographer Fernando Guerra presents many photos of Utopia Villa designed by Aires Mateus, and other recent works. Fernando Guerra posted many photos of Jeju House in Korea by Alvaro Siza, Casa no Aroeira by Aires Mateus, Casa no Pico by SAMI and Basque Culinary Center by VAUMM. ArchDaily shows 27 photos of House In Leiria designed by Aires Mateus. 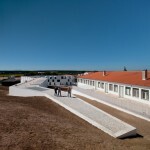 dezeen shows 26 photos of a nursing home in Alcácer do Sal, Portugal, designed by Aires Mateus. dezeen shows 9 photos of Casa Areia in Comporta, Portugal designed by Aires Mateus. Photographer Nelson Garrido shows more photos.